I think like most people in our field, I am often asked how to get started in eLearning. Well, the eLearning Industry site has released "How to Become an eLearning Professional," an ebook of tips for people interested in getting started. It has practical advice from 23 leaders in the field. It will definitely be a resource I share with people interested in entering our field. While we're on the subject, I will add that anyone getting started in elearning need to be prepared to invest the time to acquire the competencies needed. There are many misconceptions about our field that mislead people in believing they can start by simply acquiring the "right" development tools and jumping right into making courses. As anyone working in the field will probably agree, it is not as simple as mastering the development tools. It also involves becoming competent in elearning design. Without a focus on design, and I have seen this many times, one will just spin their wheels (e.g., develop courses that do not provide effective instruction, do not address the audience's learning needs, etc.). If you are interested in elearning, do not look first to the development tools, but rather how to DESIGN learning. Here is a list of ISD graduate programs, which I believe are worth the investment. I know not everyone is interested in the graduate school route and in that case you may look to certificate programs or workshops whether at an academic institution or through groups like ASTD or the eLearning Guild. Reading elearning blogs is also a good way to learning more about elearning and finding additional useful resources for getting started. Plus, blogs often provide opportunities to pick the brains of many knowledgeable practitioners. eLearningLearning is a good place to find such blogs. Following elearning designers on Twitter is another good way to expand your personal learning network (PLN). Good luck and don't forget to check out the "How to Become an eLearning Professional" ebook. I've been catching up at work since my trip to the DevLearn Conference. Although I do not have the time needed to write a very lengthy post about my wonderful DevLearn experience, I at least want to post a bit about some of the things that impressed me and also provide some post-conference resources. By the way, the only complaint I have about the conference is that there were just too many great presenters. I continually found myself deciding between multiple interesting sessions occurring at the same time. Some of the sessions I enjoyed are listed below. Many of the other presentation slide decks are available on the DevLearn Handouts page. I really enjoyed the keynote from TalentAnarchy. The video and their Hacklab handout are online but Guild membership* is needed. If you are not a member, here is a link to a short video from another one of their "Hacking" presentations. Other keynotes along with concurrent session videos including my "Adding More "Character to Your eLearning" session are also available. I recommend visiting David Kelly's curated backchannel, who has many great resources from the backchannel and also did an amazing job putting this conference together. There were so many great sessions, networking and all around e-learning fun, I highly recommend the conference to anyone that can make it next year. *Although some of the videos require paid membership, the benefits of membership are well worth the price. If on a tight budget, there is no cost for the Associate level although access to Guild resources are limited at this level. Check out membership options here. I am über excited to be heading to the Devlearn Conference next week and just as excited to be presenting too. I'm willing to bet most of this blog's readers have already heard of this conference. If not, it is the best elearning conference you can attend in my opinion. It is chock full of great sessions, a phenomenal DemoFest, truly inspiring attendees and even a live #LrnChat. However, it can get overwhelming, but do not fret because there are plenty of helpful resources for anyone attending and here are a few. 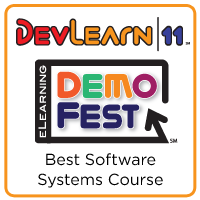 The Devlearn Docent program - A great for first timers who would like some expert guidance during the conference. IDGlobalEvents Blog DevLearn post - Wonderful tips for anyone attending. The DevLearn App - An app with many features including session descriptions, a personal schedule, social networking with other attendees and speakers and much more. The #Devlearn backchannel - Great way to participate, interact and share your experience. FYI: If you can't attend in person this is the next best thing. If you are there please look for me and say, "Hello." Hope you can attend my session too (304 -Adding "More" Character to Your eLearning). I am very excited to be presenting at the eLearning Guild's DevLearn Conference this October. If you are heading to the conference this year, I hope to see you there. If you cannot attend, keep an eye on their Twitter hashtag, #DevLearn, which is a fantastic conference backchannel. I will be discussing using characters in eLearning, a topic near and dear to me. Below is a description of my session. Designers of eLearning continually search for ways to ensure their courses are engaging, interactive, and relevant to their audience. Marketing of online courses and use of social media in learning is also a continual struggle at many organizations. Use of characters can help these efforts; however, designers face common pitfalls like creating characters that are one dimensional, overused, or inappropriate for the content. There is also little use of characters beyond courses, for example in marketing of courses to learners and using them in social media and informal learning where they can be of immense help. Participants in this session will learn how to effectively use characters in the design of learning programs. You’ll see examples of eLearning courses that successfully use characters, and you’ll learn how to weave characters into your learning designs resulting in more engaged course participants, personalized learning, added entertainment value, and an avenue for your learners to interact more directly with the content. You’ll get specific strategies for using characters in marketing your courses and employing them in social media and informal learning. Where you can find resources for creating original-character graphics or acquire ready-to-use characters. The eLearning Guild's DevLearn Conference is a fantastic conference for anyone in eLearning whether just starting out or an expert staying sharp. Take a look at this year's sessions. Hope to see you there and hopefully you will also stop in to attend my session. 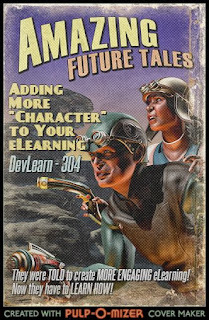 Here is another post regarding the use of characters in eLearning. Below is a collection of some of the more unusual characters from my courses and job aids along with brief notes on how they were used. The ghost of Alexander Graham Bell - He floated about while coaching staff through using the new IP Phone system. Ossie, the robot sidekick that assists during the Office 2010 course and also keeps the course's superhero, Captain Upgrade, out of trouble. Zombie PC Techs instructing staff on how to prep their computers and manage files before an operating system upgrade. FYI: The zombies used in this job aid were created and generously shared by Kevin Thorn, Chief Nuggethead at NuggetHead Studioz. eLearning Cyclops is now my blog and Twitter avatar, but was once a friendly banker that taught bank applications. I recently attended the MedBiquitous Conference at Johns Hopkins. This conference focuses on technology standards in health care education (conference hash tag - #Medbiq2013). There was quite a lot I saw and learned during these two days, but here just a few of the things from the conference that I wanted to throw up on the blog. The Center for Disease Control and Prevention (CDC) has a great open online learning site, CDC Learning Connection, also added it to the Free eLearning page. In addition, they have a good guide for elearning designers, E-learning Essentials Guide, which is a good resource for anyone involved in creating elearning, especially anyone new to the field. CDC has a goal of developing a central data store for public health training in which LMSes can go. Note: They are doing some cool work with Experience API... I also learned Tin Can API is also being called ExperienceAPI, but it depends on who you talk to, ADL or Rustici. I saw a presentation on a mobile health application called EMocha. It was developed by Johns Hopkins Center for Clinical Global Health Education and is used in Africa and also right here in Baltimore. I was very impressed by a presentation titled "Teaching Clinical Reasoning Using Game Tech," which showed one of their study's applications that used game tech in learning. What impressed me the most was use of video embedded in the interface. This simulator, which included an electronic fetal monitoring (EFM) and a labor and delivery room, allows one to view and hear the learner via video embedded in sim (see pic below). Being able to view and hear the learner's immediate reaction and feedback to the simulation was great as a course evaluation tool and can be a helpful in coaching the learner too. If you are involved in health care education or training, the MedBiquitous Conference is a great learning event. Hope to see you there next year! Over at L & D Global Events they have been posting a series of interviews of learning and development professionals. I have been reading them over the last several months and it has been a real pleasure to learn more about others in the field, including their perspectives on the L&D business, where they've been, where they're going and more. This week they gave me the honor of including an interview of me. It is very flattering to be included in such great company. A great big thank you to @LisaAGoldstein and all the folks at L & D Global Events. Go check it out - "Meet Jeff Goldman."